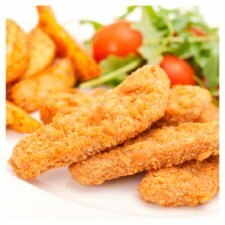 Make a hearty evening meal with these chicken goujons, made with 100% chicken breast meat. Coated in crunchy golden breadcrumbs and great for dipping. Oven cook in 15 minutes. For an easy family meal by serving chicken goujons with potato waffles and green beans. 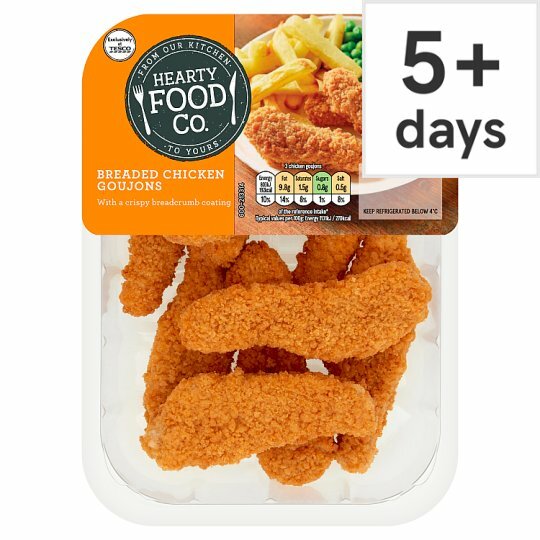 Hearty Food Co is exclusive to Tesco. INGREDIENTS: Chicken Breast (58%), Wheat Flour (Wheat Flour, Calcium Carbonate, Iron, Niacin, Thiamin), Water, Rapeseed Oil, Pea Starch, Pea Fibre, Spices (Paprika, Turmeric), Yeast, Salt, Vinegar. Instructions: From frozen: 220°C/Fan 200°C/Gas 7 15-17 mins Place on a baking tray in the centre of a pre-heated oven.